The Dragon Fire BBP (Blood Borne Pathogen) Rescue gloves offer full protection from the elements at a rescue scene. With protection from flame, cut, or puncture, and an extended cuff with liner retention system, these gloves are perfect for all rescue situations.The BBP Rescue glove has a sewn in flame, cut, puncture, thermal and abrasion resistant liner. 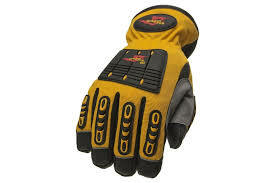 Integrated into our glove is our field proven, extreme duty vapor/BBP barrier.